We will recover any photos, videos or other files that have been lost due to your memory card becoming unreadable. If we cannot recover your photos, there is no charge. 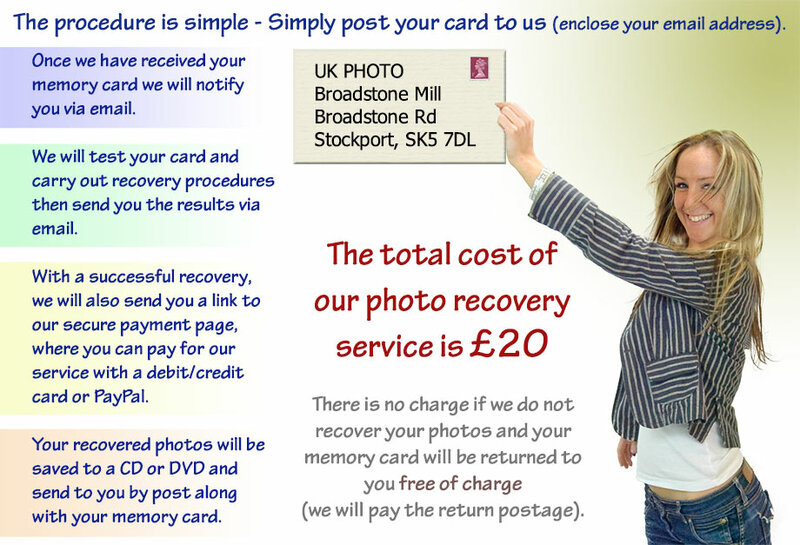 All recovered photos are saved to a CDs or DVDs and returned to you with your memory cards. Static electricity can cause your memory card to become unreadable to your camera and computer. Usually your camera will not recognise your card, and your computer will prompt you to format your memory card when you insert it into your card reader. Physical damage can, of course, prevent you from reading your memory card, sometimes this damage is too severe to recover any photos, but until we receive your memory card, we cannot assess its potential for photo recovery (remember - if we don't recover any photos, there is no charge). Sometimes, particularly when you have continued to use your memory card, after it has shown symptoms of failure, we will only be able to recover parts of certain images, this is due to the unrecoverable parts having been overwritten by the photos that you've taken subsequently. Recovering photos that have been deleted accidentally can also suffer from the same problem. If you have continued to use your memory card, then you will have over-written parts of your cards memory that had been used to store your deleted photos. Memory cards that have been accidentally formatted can usually have any photos successfully recovered from them. If the formatting was done in your camera, however, the formatting can, especially on older cameras, remove all traces of data from your card. The tests that we carry out on any memory cards that we receive are extensive. If there are any photos to be recovered, we will recover them. You can simply bring your photographs to our studio at Broadstone mill. If your memory card has snapped or cracked, we cannot repair it. There are two components to a memory card; the memory chip and the controller chip. If either of these has become damaged then we cannot recover your files. A map indicating our location can be found here: map. If you have any questions regarding our memory card recovery service, please enter them in the box above. Enter either your email address or telephone number depending upon how you would like us to contact you. If your memory card is not in the list above, don't worry, we support all the memory cards that have ever been made and will support all future memory cards. Video and any other media files will also be recovered, but depending upon the nature and severity of the damage to your card, large video files may not be completely recoverable. Our studio/shop is located between Manchester and Stockport. Our studio customers come from across the northwest of England.